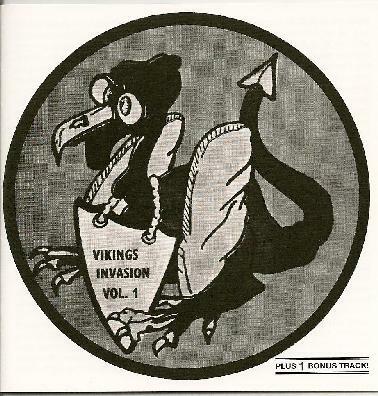 Vikings Invasion are a blues-rock group from Basle, a city situated in the German speaking part of Switzerland, on the German border, and this is a re-release of their 1975 album Vol. 1. From the beginning I hear a definite blues in the music. This is done in a would-be Ten Years After way, while there is also a John Mayall & The Bluesbreakers type of sound in there as well, maybe to soften the roughness of the heavier tracks, because this album is very rough and raw throughout its fifty-some minutes. However, this is a good thing, as it gets the anguish and the sorrow of the blues across satisfactorily, while also giving the heavier distorted tracks a little room to vary in the sound levels, as there is a lot of stick hits from the drums and mistakes on all parts, which give the whole thing a practice room sound, rather than a studio album. Nonetheless, the energy and passion for the music shines through all that, and at times it is a wild freak out, rather experimental in places, although blues is still the major influence, so a liking for the blues is a must on the listeners behalf.